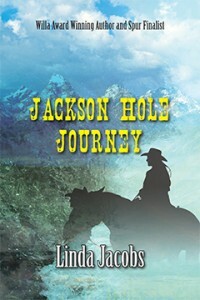 Jackson Hole Journey ($15.95, 328 pp., ISBN: 978-1-60381-910-7), is an historical romance by Linda Jacobs. On a dude ranch plagued by natural disasters in the 1920’s, two brothers compete for the love of the same woman. Linda Jacobs is the author of three other novels in the Yellowstone Series. She is a past recipient of the WILLA Literary Award and a SPUR Award finalist. JACKSON HOLE JOURNEY is distributed by EPICENTER PRESS/AFTERSHOCKS MEDIA. Booksellers and Libraries, please contact: orders@epicenterpress.com. “Jackson Hole Journey is an entertaining mix of a character rich story of people in peril, in love, and in everyday life, and almost a travelogue about one of America’s most scenic places.” Read more …. “While the characters are bright and fascinating, the real star of JACKSON HOLE JOURNEY is the setting. At times it’s peaceful and other times chaotic but one thing’s for certain, you won’t be bored.” Read more …. Francesca di Paoli, a gifted yet penniless chef, arrives in Jackson Hole in 1925. Rescued by William Sutton, the “steady” son of a dude ranching family, she begins to feel safe, until the historic Gros Ventre landslide buries her and William alive. Though they survive, the uncertainty in the valley, as a new lake forms perilously behind the slide debris, parallels the uncertainty of Francesca’s fate. William saves her again, finding her work in the Suttons’ ranch cookshack. There she meets William’s brother, Bryce, a charming wanderer. William and Bryce, already rivals for their parents’ approval, begin to vie for Francesca’s attention. Over the next two years, valley ranchers clash over a Park Service proposal to extend Yellowstone Park south to Jackson Hole. Bryce comes and goes, taking a piece of his parents’ and Francesca’s heart with him each time. Yet, when the Sutton’s Nez Perce uncle comes to the ranch to die, it is Bryce who helps nurse the sick man. William has never accepted his Nez Perce heritage and his uncle’s arrival rakes up the ire of an unsavory contingent in the valley. Men like Dieter Gross, who disdain Native Americans and foreigners like Francesca, may well resort to violence if they discover the Sutton ranch’s black foreman is seeing a white woman. Meanwhile the earth has not finished trembling, nor the river rising. When the flood waters retreat, who will be left standing? After thirty years as a professional geologist, Linda Jacobs attended Rice University’s novel writing program and never looked back. She has published three books in The Yellowstone Series and two romances under the name Christine Carroll. Although the Camel edition of Jackson Hole Journey is the novel’s first time in print, an audio version was a finalist in the 2011 Spur Awards. Married to fellow geologist Richard Jacobs, Linda divides her time between the West and the Shenandoah Valley of Virginia. Click here to find Linda her online. Past midnight, the wind came up and played a moaning dirge, making the big window shudder in its frame. Its keening cadence reminded Francesca of winter, when fierce gusts battered the cookshack. Laura slept with her jaw slack. The irregular cadence of Cord’s snoring helped keep Francesca from nodding off. She found herself counting the seconds between Bitter Waters’s breaths. He would inhale, chest heaving, then his lips would seal. Ten, thirty, forty-five seconds—by the relentless ticking of the wall clock—until, with a panicked snort, his mouth gaped like a fish’s on the bank and he continued to live. Hours passed and the clock wound down and stopped. Francesca stared at it and at Bitter Waters, but the cessation of the ticking had not marked his passing. Finally, the realization that she hoped each time he stopped breathing would be the last drove her from the room. Cord and Laura still slept. Bryce lay on the sofa, his head pillowed on his arm. She touched his shoulder and for a moment, they looked into each other. “My turn?” His voice sounded thick. In the flickering light, the kitchen clock said it was nearly four. Less than an hour until summer’s dawn would paint a seam of silver gray above the Gros Ventre. Bryce went in to Bitter Waters and she lay down. The leather on the couch was still warm. The door to the lean-to opened onto blackness …. The candle had burned out. Shifting her position, she tried to ease the places where knives seemed to have been inserted beneath her shoulder blades. She moved her restless legs. Hunger pangs roiled, but she did not want any broth. Giving up on sleep, she went to the fireplace, stirred the embers and added two logs. From the lean-to, she heard a rasping breath, followed by silence. Her shoulders hunched, her bare toes curled on the chill stone in front of the hearth. Without warning, a wave of relief washed through her. She seized the lamp from its hook and ran to the lean-to. In the wedge of light across the bed, she made out Bryce, sprawled awkwardly on the straight chair, asleep. His extended hand covered Bitter Waters’s. Cord and Laura also slept. Francesca tiptoed to the bedside. Bitter Waters mouth hung open; he did not blink at the light. Though she felt certain his soul had departed, she stood a minute, and another, giving Bryce and his parents a little longer to live in the time before Bitter Waters died.